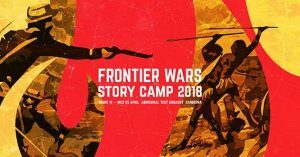 Graeme Dunstan veteran peace worker and cultural activist reports from the fourth annual Frontier Wars Story Camp. 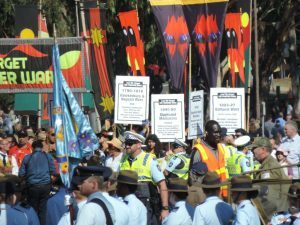 Australian’s cultural understanding of war is based on the silences and lies surrounding the frontier violence which occurred during settlement. 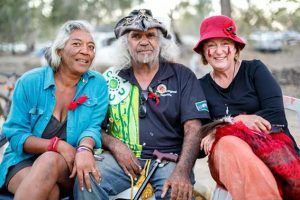 Peace workers in Australia have been working for many years to challenge the way Anzac is conceptualised as a foundation to other work against war. Floral activist, Hazel Davies, set up a Desert Pea-making workshop at the Embassy where she shared the creation story of the Desert Pea as an indigenous ‘blood’ flower, the native equivalent of the Red Flanders Poppy, and showed visitors how to simulate a Desert Pea with red felt and beads. The annual lantern lit Anzac eve Peace Vigil was also part of the program. The 2018 Anzac Eve Peace Vigil, the seventh annual vigil; attracted about 120 participants. At the event, they used 140 tetrahedron shaped, candle-lit lanterns. The lanterns are stored at the Silver Wattle Quaker Centre near Bungendore. Since most people return the lanterns, as master lantern maker I only have to repair those damaged in transport. The experienced network of volunteers, make the production of the event easy. The Chorus of Women are now experienced, well prepared, and their songs are well rehearsed. Nin Phillips, the Nunawal elder who has been giving the welcome at the top of Mt. Ainslie for the past four years is well rehearsed and knows what to expect. Promoting the Vigil has also become easy because Canberra people regard it well. In fact, it was included in the printed program of the 2018 Canberra and Region Heritage Festival. The big creative challenge of the Vigil is conducting the liturgy in the Forecourt of the Australian War Memorial. How should we create a secular sacred experience to match that of the Dawn service, that maximises participation in a sharing of lamentations and the yearning for peace? 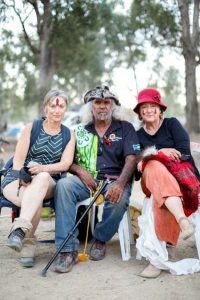 Camp Convenor Chris Tomlins arranged for his maternal uncle Ned Hargraves, a Warlpiri elder, to leave his country and travel to Canberra to support him during the Camp. This was a major accomplishment. Tomlins and Hargraves had come to Embassy via the Confest during the previous Easter on the Edward River 80 km west of Deniliquin. There, Ned painted up and taught a ‘Reconciliation Dance’ to a racially mixed group of men—”ten white, ten Black, minimum.” Ned used a deep red ochre he had brought from his country, in addition to fluff feathers to stick on with sugar paste. 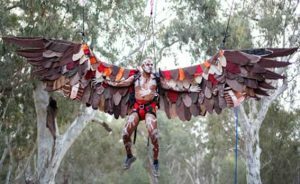 He arrived at Confest with the feathers still attached to three dead wedge tailed eagles, road kill from their journey. Hargraves also made ceremonial head gear for the dancers. These were conical caps made from leaves and twigs, and bound with red woolen thread. It took most of the day to paint up, a patient and intimate process. Rehearsal time was limited. To the sound of didgeridoo, the men came stamping out of the dark towards the central Confest gathering fire. The first attempt was somewhat fumbled and the light poor. The crowd called for a repeat. Uncle Ted invited any man present and wanting to join them. This invitation was taken up with alacrity, and with the second performance, 50 men came stomping towards a brighter fire. The impact on the Confest crowd was truly profound, like finding a friend after a long search, the satisfaction of a deep yearning. Next evening, in a dusty sunset, a women’s reconciliation dance was performed, which, likewise, blissed the women who painted up for it and the audience. 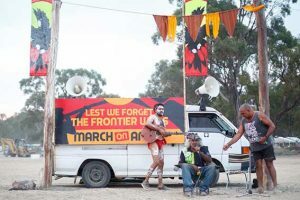 Arriving at the Tent Embassy, Uncle Ned wanted to present another Reconciliation Dance on Anzac Day. 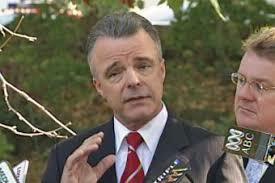 I suggested at the end of the Frontier Wars march, outside the AMW and before the official Anzac ceremony. That way, it would be a big media event. Chris Tomlins wanted this too, and Uncle Ned agreed, but then changed his mind for a smaller, more sacred event and no media attention at the Sacred Fire of the Embassy at sunset on Anzac Day. Meanwhile I had shot off a media alert about Uncle Ned and his intended Reconciliation Dance at the AMW. The journalists must have begun chafing AMW director Brendan Nelson about this because he sent me an email asking that, out of respect for the families of service people, whose special event the Anzac Day parade was, this not happen. The ensuing exchange of emails between us spelled out our positions in the campaign to have the AMW recognise and commemorate the Frontier Wars. Ned’s Reconciliation Dance occurred at sunset, witnessed by a small crowd of Embassy residents and tourists who happened to be passing by. The dance was short but powerful—indeed it was the most powerful piece of cultural performance I had ever seen on Embassy. 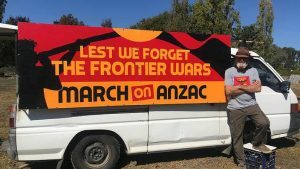 The Lest We Forget the Frontier Wars campaign might be the most sustained campaign to reform Anzac Day that the AMW and the RSL have ever faced. Numerous historians and journalists are urging the change. 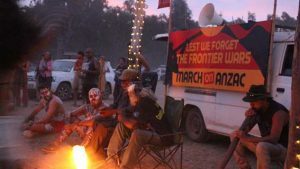 The Frontier Wars March and its promoting Story Camp are where and how supporters can make direct contact and vote with their feet. As can be seen in the email exchange with Mr Brendan Nelson, who can barely bring himself to use the words ‘frontier wars’, the campaign has led the AMW and the RSL to make major efforts to recognise and include the ‘Black Diggers’ in Anzac commemorations. This has meant among other things, changing the Dawn Service liturgy so as to start with a didgeridoo solo, the now obligatory inclusion of Aboriginal faces in AWM exhibitions, and having Black Diggers up front in the Anzac Day March of 2017. In fact, the AMW recognises only wars that have taken the Australian military overseas to imperial wars—wars of empire, first the British, and now the U.S. Empire. Recognition of the Frontier Wars interrupts the glorification of that narrative. 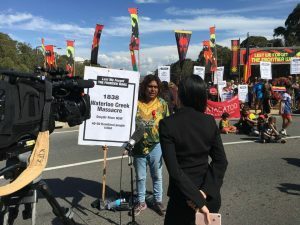 It also brings into witness both the deep denial of the settler state about its land grabbing invasion, and the conscious attempt to distort Australian history and promote militarism as the national ethos. Which explains why the military establishment at the AMW is so reluctant to accommodate the change, and why it is so important for promoters of an independent and peaceful Australia to campaign for the reform. During the Camp, a journalist for a webzine called The Sydney Criminal Lawyers sought my opinions on the Frontier Wars campaign. There, I suggest, what might happen if the AMW recognised the Frontier Wars. For sure, we are winning the media on our campaign to remember the Frontier Wars as part of national Anzac Day commemorations. It is only a matter of time before that change comes to the AMW. But before that happens, we will likely see small grassroots actions to memorialise the Frontier Wars locally. Individuals and small groups making their own Lest We Forget the Frontier Wars Desert Pea wreath and laying it upon their local war memorial on Anzac Day. This is the genius of Hazel Davies Desert Pea campaign. It combines a creation story about blood soil with the invitation to make art and act locally. Her stated vision is of Desert Pea Frontier Wars story on every Australian war memorial within five years. I am grateful to all the volunteers, helpers, performers, marchers, lantern and flag bearers, and community activists who made these events possible. Australian Nonviolence Projects/Beyond War funding was used to pay for some costs associated with the project.